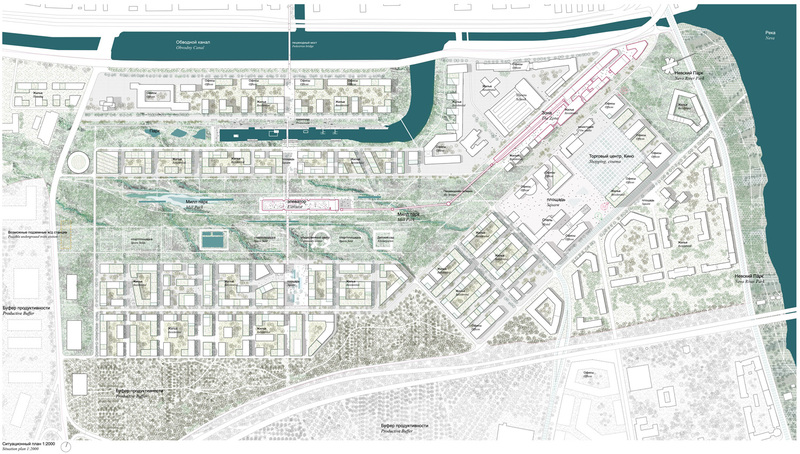 Our proposal aims to turn the existing resources in the Grey Belt into tools for a sustainable development by utilizing the green and blue landscapes, the industrial legacy and the existing public infrastructure systems. 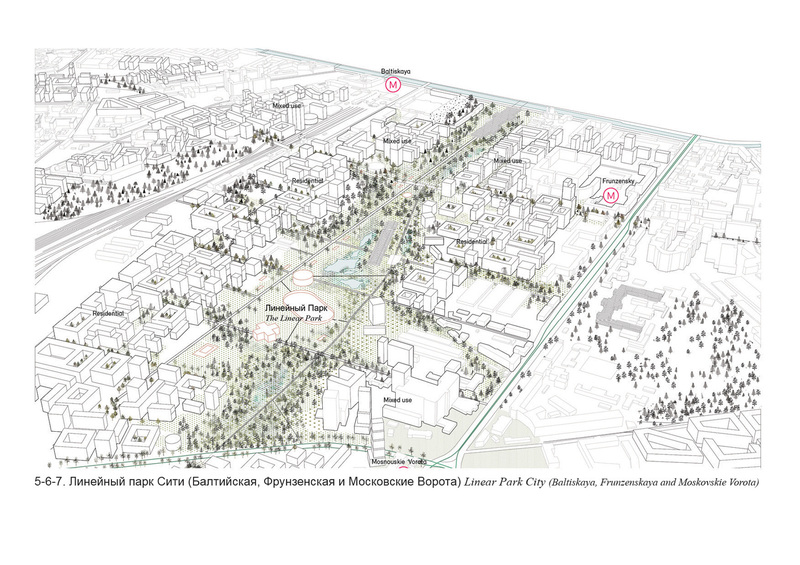 Our concept consists of a landscape strategy for highly performative ecosystems, a strategy for sustainable industrial zones along the traffic corridors and a densification strategy around metro hubs building the foundation for a green future, not only the Grey Belt, but for the entire city of St Petersburg. 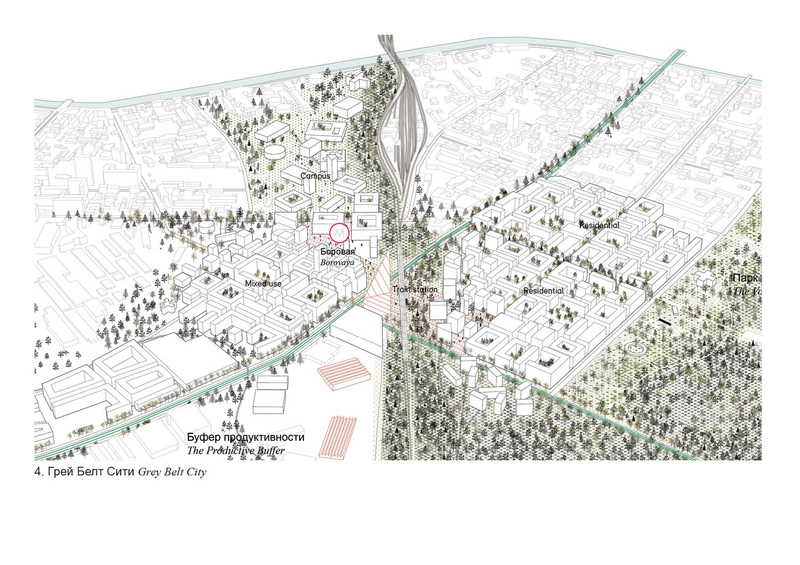 We propose to turn the existing green structures of the Grey Belt into multi-performing landscapes. 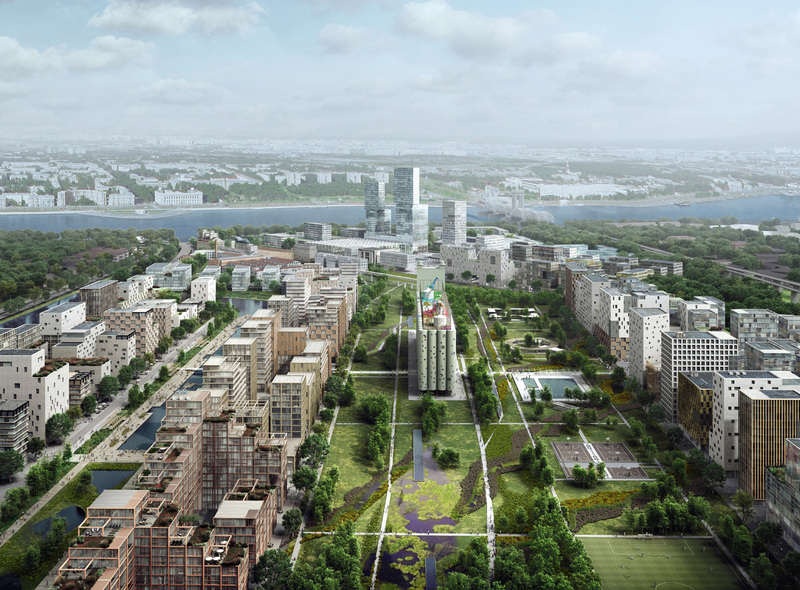 Our proposal defines four longitudinal green corridors in the Grey Belt: The Ekataringofka Seaside Park, The Linear Park, The Volkovka River Park and The Neva Riverbank Park. 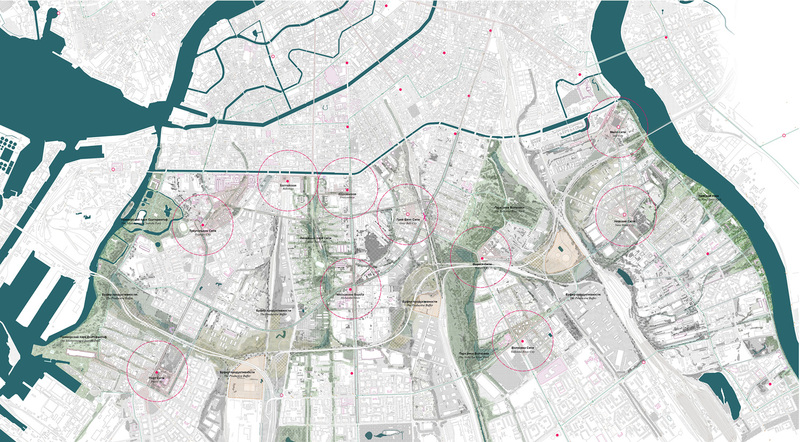 These landscape ecosystems delivers a series of “services” for the city of St Petersburg including cleaning up the air and the ground, collecting and filtrating rain water, increasing biodiversity and producing energy. 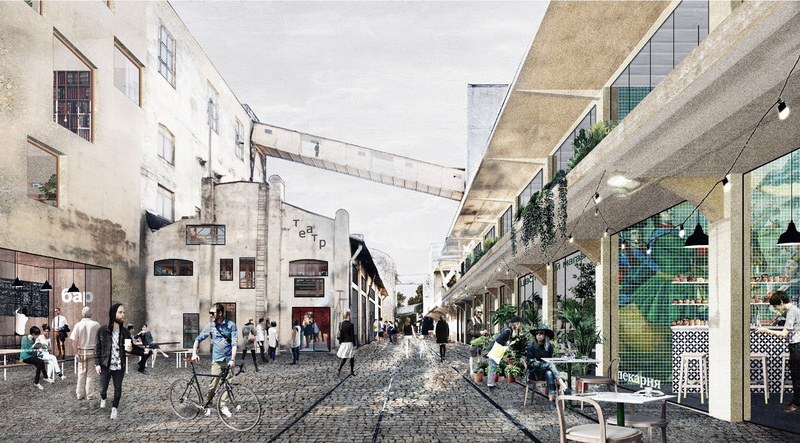 In addition they provide vast recreational spaces for the residents of the area. The productive buffer is a strategy for the location of sustainable large scale production, distribution and repair within the Grey Belt. 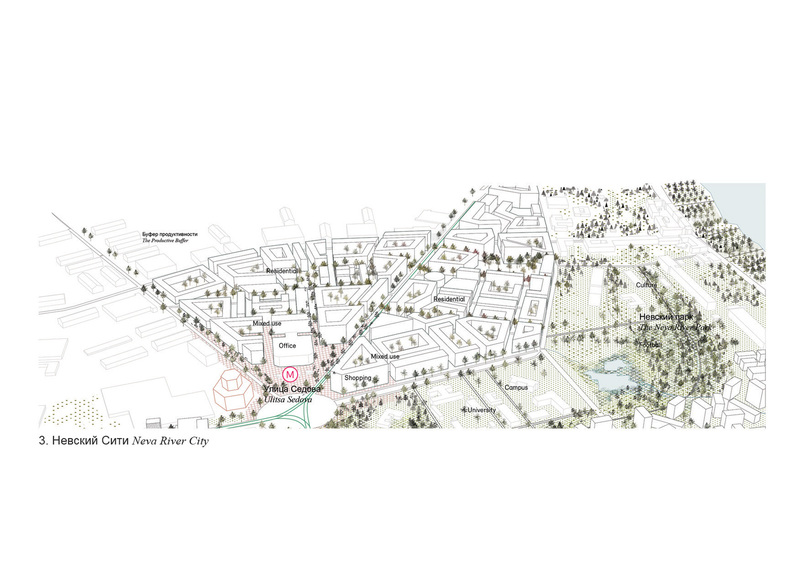 The strategy aims for the immediate space around noxious infrastructures to be exploited and turned into a productive, reclaiming and innovative landscapes benefiting its surrounding areas rather than being a “left over” space. 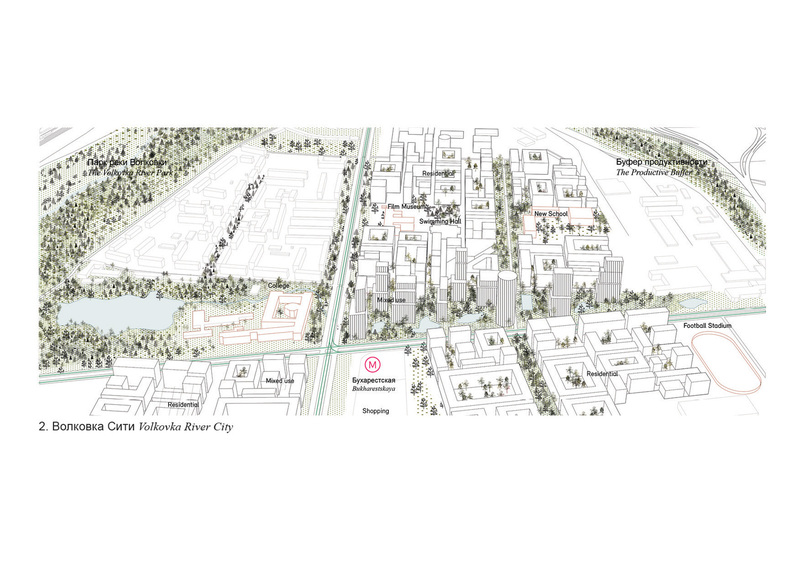 The 10 tales is the strategy for the urban development areas. We suggest centering the growth in the Grey Belt around the existing and planned metro stops of the Grey Belt as a transit oriented development. These areas benefit from a high rate of daily passengers that can be the basis for dense programming and urban intensities.